How do you silence Mojave “Your Disk is almost full” notification? 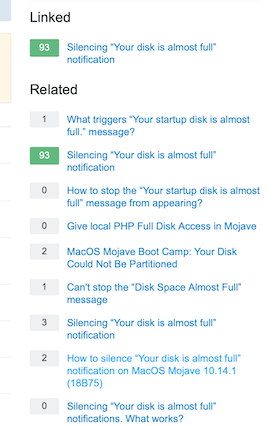 [duplicate] How do you silence Mojave "Your Disk is almost full" notification? The first two answers suggests to use the terminal. Using the terminal isn't the macOS way. It's the linux way. The third suggest it's a bug. None of the answers are any good to a novice user. None of the answers explain the downside of doing what is suggested. The cited article doesn't explain what the problem is. The best answer is to delete some stuff, which isn't an answer in the cited article. Saying the question is a duplicate is bad advice. This is a novice user, so how are we being nice to the user? Thanks for asking on meta! Nice is being polite in constructive criticism or pointing out how to reverse any decision that's relating to closing or deleting. It's super simple to edit the question - anyone can edit it so that it's totally clear how it's not different. Let's look at option 3. So - if you are trying to make use of the linked article - say that at the start. Explain which specific steps on which specific answer you tried and your results. Once it's clear how you need help understanding or getting past a roadblock, it's no longer a duplicate. Now - sometimes editing a closed question is hard - there are comments, there are attempts to answer and people are more caught up in what happened to get there and they can't look at the question with new eyes. No problem, just ask a new question - make it well edited - clear and let's see if it's going to avoid closing. This question is over 2 years old and doesn't work with the newest version of MacOS (10.14.2). This is also not helpful at all. That's a statement up to interpretation. Help us help you by clearly explaining why you felt it would be helpful and why it wasn't. Document the problem instead of say "there's a problem" and then leaving it up to anyone's guess as to what you see the problem to be. Why was this marked as a duplicate? The thread linked is over 2 years old and no longer applicable. I already tried everything in that thread. You fell into the trap to put what should be a comment into the body - just delete that, it can't make anyone want to vote to reopen since now there's that to clean up once it reopens. It's opinion whether terminal is Mac like or Windows like or just odd. The fact is terminal exists and is powerful and lets you do things you can't with a mouse and keyboard (other than open terminal, of course). It's OK to say you don't want to use scripting, but this site allows anyone to answer so even if you don't want that option, your question exists more to help everyone than to help you. The whole reason people answer here is to contribute to knowledge. If you're just looking for 1:1 tech support, I can see how you're disappointed, since that's not at all what happens here. You get 1:1 tech support when you ask a clear, amazing question and that support is a by-product of the actual good being produced. Open source Q&A that are up to specific documented standards. None of this is a reflection on you - it's OK to want help and it's ok to ask for it just as it's OK for people to vote to close when that makes sense given the site norms and rules. Migration rejection followed by repost on original site closed as duplicate, how do I proceed?